Think of something better than a sunny Sunday in Bruxelles. Free chocolate leaking from trees? Maybe. 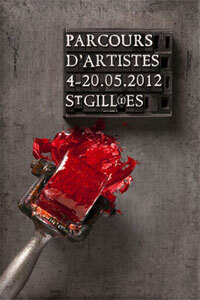 We were actually referring to Saint-Gilles’ “parcour d’artistes”. Tens of artists meet ordinary people in their own house-atelier. They can sell (yeah, artists are part of the market in Northern Europe!) their works (the European Commission will guarantee competitive prices) but even show and explain them only. Against a vision of arts as an elitist sector, in which mutual ignorance represents an added economic value, this public initiative, at its fifth edition (the first one in 2004), confirms the vitality of a curious neighborhood, Saint-Gilles. Following the rise of the new Bruxelles as a whole, the little shop of Saint-Gilles mixed the so-called “ethnic” diversity with the “age” and “culture” diversity, developing those dynamic metropolitan codes that always anticipate new real estate price explosions. It’s as if arts and social media, in the whole Europe, were forced to perform the dirty job that “free market” is not capable to manage: innovation. The only problem is that when the first ones “steal” ideas from mainstream culture, they are called “pirates” and severly judged. When it’s the latter that steal grassroots innovation, mad men call it “crowdsourcing”. The talent-seekers, of which Naomi Klein already talked in her “No Logo” more than ten years ago, will have a new chance to get some fresh ideas (for free) soon. Among the members of Smart, the influential trade unions for arts, “Les Ateliers pARTage” and more partners organize “Festival art links – l’art crée du lien”. This meaningful initiative in the little shop of Saint-Gilles will allow arts specialists and common people to meet and share expositions and discussions, in particular about the most important and popular form of arts nowadays: the networking.